Originally developed for the USAAC as the XA-22 attack bomber, it was rejected by that service and so was able to be offered for export. France was in real need for modern aircraft so placed a relatively large order. When the French capitulated in June of 1940, the aircraft not yet delivered were transferred to Britain. In RAF service the aircraft became known as the Maryland. The total number of aircraft delivered to the RAF was 225. The type saw limited action with the French Air Force, most being flown to areas outside the immediate area of German occupation and became a mainstay of the Vichy Air Force. Those flown by the RAF saw most of their service in North Africa and the Mediterranean where the opposition wasn't as fierce as it was over Europe. In this area they proved to be quite capable. A number of them were delivered to South African Air Force units for use in the theater as well as being used by Free French units after the North African Invasion. To this author's knowledge, there are no extant examples of this aircraft. Hey, it's a Frog kit! For many of us, it was Frog that really kindled the fires of modeling. When I got back into modeling in the early 1970s, it was Frog kits that were being built, not the Hasegawa or Revell or Monogram kits, though those also helped fill the shelves. 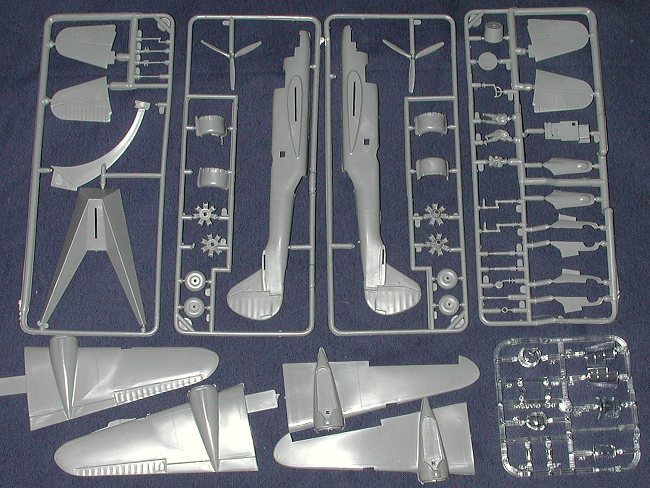 Frog was one of if not the company that introduced the multiple decal selection idea to plastic kit makers. Soon Revell and others started offering multiple decal options, but Frog not only had more interesting models, but also offered interesting decal options. I can remember looking over the kit selection and choosing a kit based on the decals that came in the box! Frog also offered models of planes that no one else did. Where else could you find a kit of the Baltimore, or the Fokker D.XXI, or the Meteor IV, or the Maryland. Even today, there are Frog offerings that have not been surpassed by other kits in 1/72. Not only that, but when Frog went out of business in 1976, the molds scattered to the four corners of the earth. Even today you can find Frog molds in other people's boxes! The Maryland is very typical of Frog kits. Minimal detail, raised panel lines, thick plastic (including the clear bits), crew members, and the option of building the kit wheels up. It even has a stand, something that you don't see much of nowadays. The instructions are equally crude, offering enough to build the kit, but not much else. No color callouts and the exterior painting guide is on the back of the box. Decals for this kit are for two aircraft. One is a Free French squadron and the other for a South African Air Force unit, both of them part of the Desert Air Force in the Mediterranean. Frog decals were generally quite good and stuck to the kit well, though these are a bit old and I'd suspect them to be a little brittle. The kit can be built into a decent model straight from the box. There is little in the way of aftermarket stuff for this kit, so it is up to your building skills to improve it. If you want to see a short review of this kit, follow this link. If you would like your product reviewed fairly and quickly by a site that averages over 2,500 visits a day, please contact me or see other details in the Note to Contributors.